Did you know that Paul McCartney died in a car crash in November of 1966, was replaced by a look-alike carefully groomed in his musical style to match that of the deceased Beatle. Crazy you say? On Abbey Road Album, why was McCartney barefoot and out of step? Was John Lennon dressed in white to represent a religious person? Was Ringo dressed like a mortician and George dressed as a shabby gravedigger? What about the policeman on the other side of the street? The yellow VW bug license plate that reads 28IF – Was this album cover staged? Shortly after this album was released, The paul is dead rumors started to take off. The hysteria of this rumor started to spread like wild fire across the country, Could McCartney really be dead? 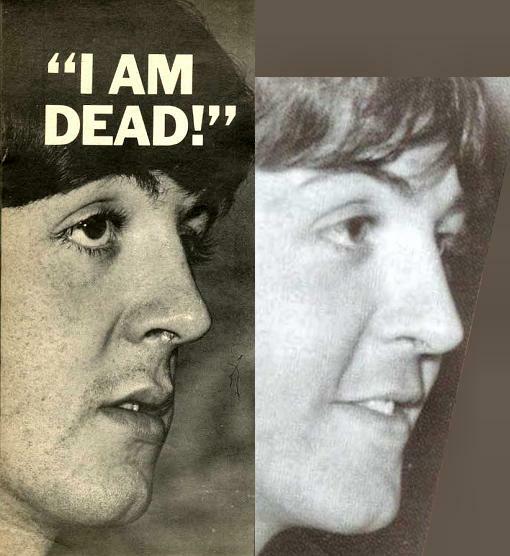 Or is this just a Paul is dead hoax? This rumor was very popular, will spend the next several pages probing some of the clues and theories behind this bizarre story. Read very carefully. You may find that sanity is not quite as easily defined as you thought. You may begin to question your own. Around this same time frame WKNR-FM DJ Russell Gibb received a phone call from students at Eastern Michigan University who claimed that the Fab Four song Revolution 9 contained a backward message confirming the rumor. Gibb played the song backwards on his turntable, and heard “Turn me on, dead man, turn me on, dead man, and turn me on, dead man “Gibb began telling his listeners about what he called” The Great Cover-up”. To add more fuel to the fire, The Beatles never wanted to talk about the Paul is dead rumors and for years just laugh it off as crazy. Which only added to the mystery of what they were up to, had they created a bunch of Paul is dead Clues to increase record sales. Austin-Healey, which he subsequently crashed. some combination of the names. Then in 1979 Beatle expert Joel Gasiler and Dave Fox produce an in depth radio show called. “Is Paul Dead? Turn me on dead man”. Which brought the dead rumors back to life like no other time. The radio program was one hour long and it started with Sgt. Peppers and finished with Let it Be. The show caused a fire storm because it gave clues off each album and played the songs backwards making it very easy for everyone to hear the clues. Beatle fans went nuts with this new program. Here it was all laid out before them, step by step and explained it all in great detail. Who was Billy Shears? That The Beatles sang about? Billy Shears (the name of the fictitious leader of Sgt. Pepper’s Lonely Hearts Club Band) and William Campbell, a winner in a Paul McCartney look a like contest in 1965. Is Paul McCartney Dead? They under covered clues that pointed to his death and nobody had noticed or heard before. The whole Paul is dead clues started to make a lot of sense to a lot of people. At the time that this very rare Beatles recording was airing, Paul McCartney and Wings were touring the UK on “Wings over Europe tour”- The media began asking Paul McCartney about the Paul is dead stuff again and he refused to talk about such silly stuff, which only made Beatle fans more interested in the Paul is dead rumors. Some fans started to believe that this really did happen, and Paul McCartney’s lack of given it any attention only sealed their convictions. This is a great Beatles radio show. Then in December 1980 John Lennon was killed, this very rare Beatles recording was pulled off the airways. Until the summer of 1981 this Beatles radio show “Turn me on dead man” ran again for several months before sitting on the shelf.